I laugh every time at this picture- see where Ry's left hand is? He's holding the ring in his pocket with his dear life! C: Anyway, I gave Ryan a "starting line", if you will, of graduation. I told him I had to have a degree before a ring so after I walked across that stage on May 2nd, I had a feeling a proposal wasn't too far behind. Ry: Blunt honesty was always something that was prevalent in our relationship so it was no secret that I was going to propose. When we went up to South Bend for Rylee and Tim's wedding in August 2014, Christine naturally fit in with my family and that was when I knew I found the one I wanted to marry- now it was just a matter of saving up for a ring. C: We had a Disney trip planned a couple of days after graduation (a place we went for any special occasion for us) so I was pretty confident that he was going to propose there- until I opened my big mouth. After graduation, we were out with our good friends Will and Ali and we were talking about a proposal when I let it slip and said "Well, you can't do it in front of the castle because I feel like that's cheesy." Note from the author: 1) So sorry if anybody who is reading this got engaged in front of the castle! I think it's beautiful it just wasn't specifically special to us. 2) Yes, I obviously know that I should've kept my mouth shut. Ry: I already had it narrowed down to three places that were significant to us: St. Augustine, our spot where we used to eat lunch in the Stadium, and the front-runner: Disney, a place we always went for any special occasion. Despite what Christine said, and even Ali thought Disney was a little too cliche, I went with my gut and did it anyway. And I'm really glad I did. C: So for the next 48 hours, all Ryan talked about was how I ruined the proposal and that he was going to have to regroup and plan a whole new one. Ry: Yeah, she didn't ruin anything but it was fun to make her think she did. C: The first day we spent at Disney we went to Animal Kingdom and Epcot and the entire time I was calling his bluff- patting his pockets trying to find the ring. I know, I'm the worst. At Animal Kingdom, we bought the ridiculous shirts pictured above because I thought they were the greatest thing since sliced bread and I told him we had to wear them the next day, not thinking they ended up being incredibly appropriate. Ry: On day one the ring was hidden in my bag back at the hotel room so she wasn't going to find anything. C: Day 2 came around and I realized that if it was going to happen, it was going to happen today so I stopped prying. I wanted it to go exactly how Ryan planned and I figured me finding the ring beforehand was not a part of that. 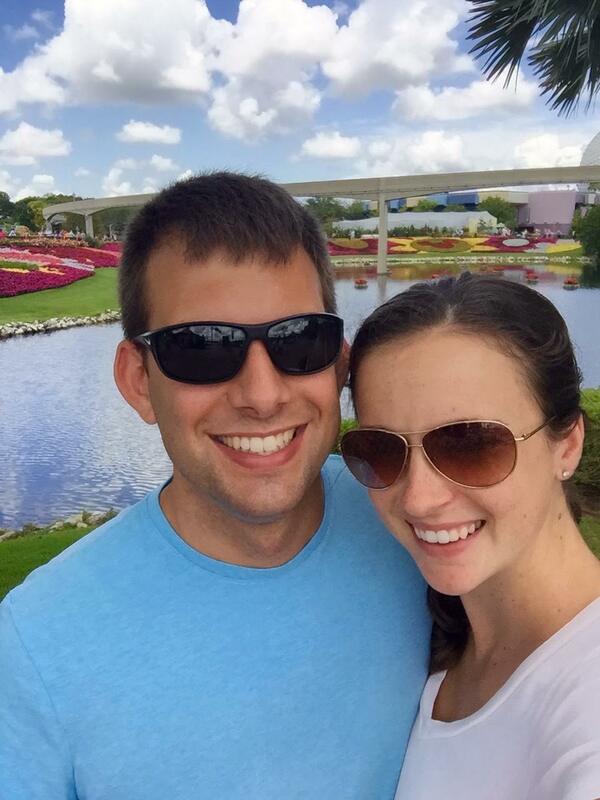 Ry: Proposal day was really stressful because we were going through a theme park and I was riding roller coasters with the biggest investment I've ever made just sitting in my pocket. If you look at the pictures above, I kept my left hand down on every ride, just to make sure it stayed put. C: When we left Magic Kingdom to go to Hollywood Studios (or whatever it's called now) I thought for sure I ruined it. I kept apologizing and saying, "If it weren't for me we'd be engaged right now!" Ry: We had talked about getting married so many times that it was probably less stressful for me than some other soon-to-be engaged guys, but that bus ride was nerve racking. Christine was saying that she ruined everything while the entire time I was trying to remember my big speech that I would have to say in a matter of minutes. C: We stepped off the bus and Ryan suggested that we sit for a minute before going on Rockin' Roller coaster and then he got quiet. He goes, "You know how much I love you, right?" And I said, "Of course I do." And then before he could say anything else, a woman on a motorized cart fell over! Ryan and another man nearby jumped up and helped her up (she was okay!) and got her things for her. Ry: So there's a moment in sports when you're about to take that game winning shot. All the pressure is on the line. And then somebody else on your team gets called for a foul. It kinda felt like that. C: He came back over and said, "I don't like this spot, it's too hot." So we got up and literally just went to the other side of where we were sitting and all of a sudden, he said again, "You know how much I love you, right?" And I knew something was up. Ry: I just had to hit restart. That spot was a bad omen. C: Honestly, from there it all is a blur. I remember Ry getting down on one knee and just being overjoyed. Maybe a little too excited because when he opened the box I grabbed the ring, said yes and put it on myself! Ry: Adrenaline kind of took over but the speech I had prepared was basically that Christine has gotten me to do so many things that I never thought possible since her and I started dating, including finding the perfect woman. Rockin' Roller coaster was one of the only times that I could remember that I got her to do something that she never would've done (ride a legit roller coaster) so it was a fitting place to start our marriage journey together. C: We wandered around the park for the next hour or so like giddy children, calling our family and friends to tell them the good news! Ry: It was especially fun to tell the family members who had said to me, "You better not blow this one!"